I first heard these Evening Grosbeak giving soft inter-flock contact calls near where I had stopped my car in Red Canyon Park yesterday. 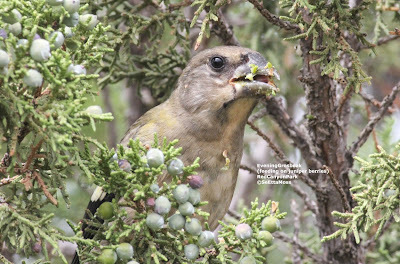 There were about a dozen of them feeding in this and nearby juniper shrubs. Interestingly all that I saw were females or immatures as shown in these photos. I had the pleasure over the week-end of having a flock of at least a dozen Common Nighthawks feeding overhead above my home. They were evidently a migrating flock that flew around and around for about 45 minutes as they fed on whatever insects were in the air. I had a similar flock feeding over the Canon City Rivewalk not far from my home 2 weeks ago but couldn't get the photos I was able to crop for enlargement as here to see the field marks. The bird in the first photo is a male--see the white tail band and large bar on primaries. The next two are of a female-no white tail band and primary bar more limited. The bird just above and below are males. The bird above and the bird below are females. 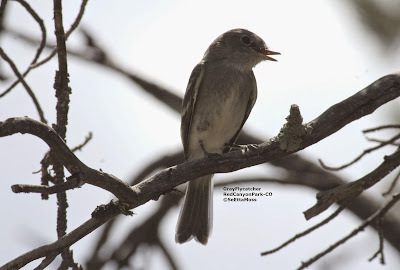 This past Monday I birded Red Canyon Park about 10 miles north of Canon City where I stumbled upon some very young fledgling Gray Flycatchers. There was definitely one parent in attendance that I observed feeding one or more of the young birds, and I believe the other parent was nearby. They were in thick vegetation and I was unable to get a photo in focus and also the parent(s) quickly moved the young away. Yesterday I returned and looked for the family. I found what is likely the same family about 75 feet from where I had last seen the Gray Flycatcher family earlier this week. An adult bird flew into a shrub less than 30 feet in front of me and I got the top photo of that bird. It was quickly followed by a calling apparent fledgling that flew into the same shrub as the parent bird flew out. As I was walking on Canon City Riverwalk today I heard a cicada fly right behind me. 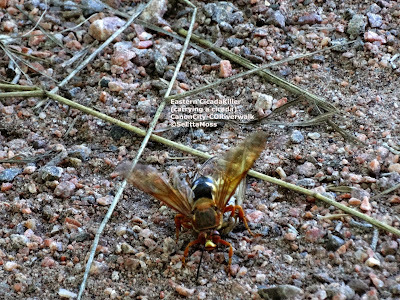 When i turned I saw that the cicada was in the grasp of this Cicada Killer on the ground just a few feet away. The Cicada Killer started dragging it away. It moved quite fast for ~75 ft to a tree then climbed the tree with the cicada in it's grasp. Lost sight of them -~25 ft above the ground. 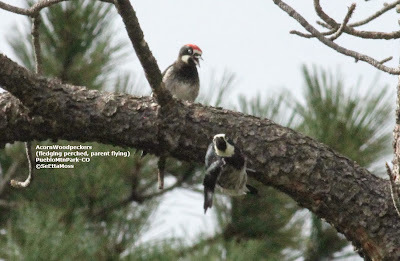 When I last checked on the Acorn Woodpeckers in Pueblo Mountain Park on July 8 the pair were flying in and out of the nest hole repeatedly so I had the impression they were caring for nestlings. This visit these rare woodpeckers were not near the nest tree but in another area of the park where I found them foraging. And I found 4 of them and it appeared that two were juveniles. 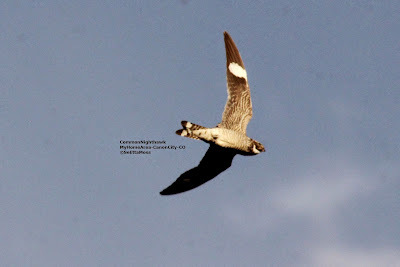 The bird on the limb in the pic above has bluish eyes which are found on juveniles.